Year 2018 will be an emotional ride for you. Pisces, 2018 horoscope shows that you will feel a connection on a deeper basis with others. You will inspire and spread positive vibes everywhere you go. Spiritual inclination will help you further expand your sense of intuition and know others better. This trait of yours will help you cure the emotional wounds of yourself and others too. 2018 is the perfect time to start a research project or invest time in occult sciences too. Financial condition will be fine this year. There are chances of getting a hold of an ancestral property. Cosmic powers will impose passion and a drive to fulfill your ambitions in you. Positively, you might get back something you have lost earlier. On the marriage front, positivity will rain in this year. 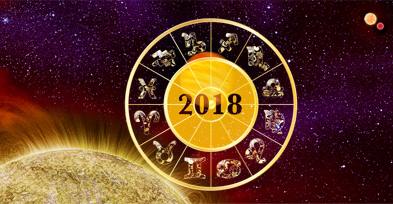 However, a careful approach is needed in the initial months as indicated in your 2018 horoscope. Expect some confusion and stress on the career front as a transfer in job is indicated during this year. Things will be a destined pattern in career matters, you will have to adapt to the changes and move on, as you have no control. Avoid investing in new ventures from March to July. Also, trust no one regarding business matters especially when you are planning to expand it. You will feel much relaxed October onwards. Career would then stabilize and you will feel much lighter. A responsible and sensible approach in life is all Saturn is asking you. The period from April to September is the time to go slow and confront circumstances head on. If you will learn to act like this, 2018 will be an easy ride. It is a good idea to avoid shortcuts to success and reach your goals step-by-step. This is the time to think twice and then act. Mars is blessing you with fortune, will power and confidence. You would feel overpowered to take risks for better. However, do not over use it and take care while taking important decisions. Year 2018 will be amazing if you will give attention to these crucial areas of life. Good financial gains are promised in this month. Government job doers or those involved in father's business are likely to get good results. Prosperity on professional front is predicted. Government authorities should be by your side. Credit & recognition for your efforts seem highly possible. It looks like an auspicious time for getting a permanent job. Even though domestic harmony remains an area of concern, wealth and cash should remain promising. You appear to be having a balanced month but a bit of caution might be required from you. Financial wealth and stability appear to be moderate this month. Travelling abroad for some government related work appears to be on the cards. Even with minor losses, prosperity should keep you happy. Doing some charity should be beneficial for you. Cordial relationship should be maintained as isolation is indicated. Try to keep your best foot forward in order to achieve maximum gains this month. Financial growth will remain moderate and minor health issues may bother you. Infections and stomach ailments may try to play spoilsport. You should be required to manage your wealth, money and assets accordingly this month. Name and fame appear to remain moderate while some efforts will be needed to maintain your charm and personal magnetism. You should be making slowly and steadily progress this month. Overall this should be a fortunate month for you. Money appears to be returning back from different sources. With betterment in personality and magnetism, prosperity looks to be rising on the cards. Cash money is should increase giving you an ability to own expensive things. You better health this month would contribute to an improved financial status and sources of income. The month of May promises a more bolder, courageous & fearless you. Wealth should be on the rise much fame and prosperity. Inclination towards religion may lead you on a pilgrimage. Strong financial status and wise decisions would earn you appreciation from all. You should be having ample power to gain material achievements. Source of earning remains promising. Carrying on from the strong decisions taken in previous month, this month also denotes a good fortune for you. Short pilgrimage owing to your spiritual inclination may occur. Your wise and honest decisions will be appreciated. Your leadership qualities make you stand out from the crowd however this may also create some issues with competitors. Your dignity, honor & respect at work appear to be rising. Your authority and position at work in unlikely to get disturbed and should only increase with time. Reputation & fame look to be rising. It is better to stay from any ego clashes at work as these may lead to unnecessary mental pressure. For students, it is a good time to apply for higher education from a Government institution. Financial prospects appear sound for job doers and for business doers; new projects should give reasonable success. Social circle may expand but prospect of progeny are not very positive this month. This is the month that should bring a lot of shine to your career. The horoscope for this month denotes monetary & professional gains for job doers. Some good news might be heard form a new network or business. Minor hurdles in life might be there but you are likely to breeze over them. Take care of health as it appears to be an area of concern. Avoid any legal conflicts as these may prove to be financially expensive. With your co-workers taking example from your skills, a rise in healthy competition may be predicted. Take this as a challenge to hone your skills and not as an opportunity to engage in clashes. Health issues may occur due to over exertion on body. Possibility of spouse experiencing some egotism & self esteem issue is there. Business partners bring financial gains and it should be a good month for trade and business expansion. A progressive period for your spouse is denoted in the horoscope for this month. Some unmatched growth may be seen in his/her life. Travels related to business should give favourable outcomes. Financial takings may rise if you manage your savings carefully. Work partners in your field of professional should be good sources of profits. Minor monetary losses might rise if you don�t manage your assets well. With some minor restrictions November 2018 promises to be a fortunate month. Luck should be in your favour and you may get satisfactory cash flow during this period. You might even go on a pilgrimage as religion would be an area of focus. You are likely to have audacity, character, & intellect along with a desire to lean towards spirituality. You appear to be having an eye of initiating new things quite successfully. Fortune appears to be on your shoulder in December 2018. Professional appears strong with an inclination towards religion. Robust energy levels should enable you to do new things. Government employees may expect some credit & recognition during this period. Respect in society would rise but minor altercations at home are also predicted. Focus more on assets and education and these should do fine for you. Good news may be expected in terms of getting a permanent job.